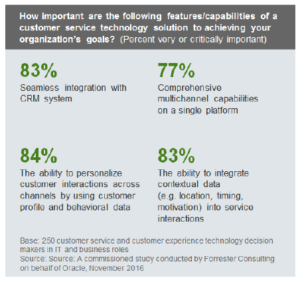 Oracle commissioned Forrester Consulting to explore customer service technology adoption to understand recent trends and business priorities. Forrester used its existing data and conducted an auxiliary custom survey of 250 decision makers in five countries to create this profile. 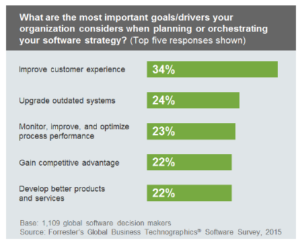 The study showed that investments on software that can improve customer experience are increasing. Business and technology decision makers seek solutions that will help them create seamless, personalized service interactions that promote customer satisfaction and loyalty. 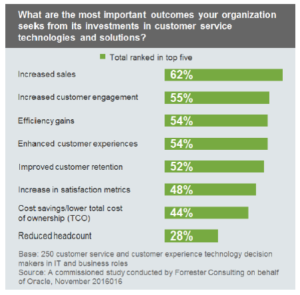 “Enterprises Invest In Customer Service To Support The Top Line”, research highlights that improving customer experience is the biggest driver of enterprise software investments — more important than product and service development and process optimization. Customer satisfaction and giving them an unforgettable purchase experience are goals that companies need achieve if they want to survive in the difficult competition struggle. Therefore, it is necessary to invest in technology in order to have both an adequate infrastructure that supports speed and performance, and updated software that will allow the use of new digital applications. In the past, many brands aimed to keep customers away from the contact center believing they have to reduce the number of contacts and interactions, but nowadays the business philosophy is completely reversed. Companies aim to increase the number of interactions in order to strengthen the company-consumer relationship. To do this they have several tools: social media, web self-service, email and phone call which are top service channels today, and web chat, chatbots and mobile app as emerging options. These applications are highly customizable, and this is a key factor to achieve expected outcome. 72% of enterprises that are currently using or planning to use digital customer service software prefer cloud-based applications.